Raleigh, Granny and Maxwell looked at each other. The blood drained from Granny’s face. Raleigh mentally sifted through a series of options. They watched on the holoscreen as the transport entered the other ship. Then the Polaris disappeared. He dashed for the elevator. Lootie sped a pod over to him. He jumped inside and it rushed down to crew quarters. He jumped out and looked around. The bomb sat on the floor of the corridor nearby, the numbers on the timer floating in the air above it. Maxwell opened a neural connection to Raleigh. He grabbed the bomb and ran back inside the elevator. Maxwell ran out of the elevator carrying the bomb and promptly tripped on a bloody body in the hall. The bomb flew out of his hands and skittered across the floor. Maxwell groaned, stunned and facedown on the deck. He crawled to his feet, shaking his head and regaining his balance. Raleigh and Granny watched him from the holovision on the bridge. Maxwell jumped off the floor and scooped the bomb up. He rushed down the hall, jumping over the remaining bodies, and pivoted through the doorway onto the flight deck. In the distance he could see the red glow from the portal’s forcefield, and hazy stars blinking through it. He ran toward the portal, the muscles in his massive legs straining. With no drones on the tarmac, he closed the distance, carrying the bomb like an athlete rushing for an end zone on a wide-open playing field. When he reached the portal he pulled his arm back and flung the bomb as hard as he could through the entrance. It sailed through the air, popping through the barrier and flying out into space. Maxwell’s eyes grew big as a sudden realization hit him. The forcefield was designed to keep air inside and let everything else pass through. If the bomb could be thrown out through the porous barrier, its blast could come back in. He turned and ran back in the other direction, putting as much distance between himself and the portal as he could. The bomb floated through space, tumbling in slow motion. Maxwell reached the door to the corridor and rushed inside, seeking the safety of the metal barricades. The bomb slowly drifted away from the ship, tumbling as it went. The Mule glowed orange on the port side as Lootie strengthened her defenses, sucking power away from the remaining shields to concentrate maximum protection in preparation for the blast. A sudden burst of white light ripped through the blackness of space. The Mule shuddered as the force of the impact slammed against her port side. A few more loose panels in the rear floated free. Maxwell picked himself up from the floor where he had covered his head, expecting the worse. He dusted himself off and chuckled in relief. He noticed the bodies in the corridor again, and all the blood splattered about from grenade and blaster fire. He frowned, his good humor and the victory of the moment forgotten. Behind him he heard a moan. He turned and found Skylar trying to open her eyes. Her forehead had split open from the impact with the wall, and blood flowed out of the gash. Jeter pressed his palm to the elevator’s panel. It flashed red. The elevator dinged and the panel turned green. The boarding party entered the capsule and it shot away. The doors opened on the quarters and mess hall deck. Jeter stuck his head out carefully and looked both ways down the corridor. Jeter shot the man in the chest. They filed out, guns ready. Jeter led them down to the Captain’s quarters. He placed his palm on the reader and it flashed red. The Sergeant looked at one of the men and made a motion with his head. The man unslung a backpack and quickly retrieved small explosive modules with sticky edges. He placed six of them on the door, then pulled back out of the way. The others spread out to either side. Williams touched the implant under his ear with one hand and raised his other in the air, finger pointed up. 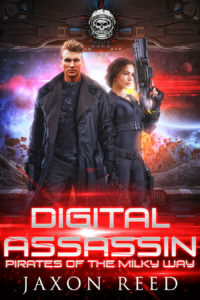 The Sergeant nodded at him, and he concentrated on the trigger over the neural net. He brought his hand down, finger pointing at the door. The door blew open. Williams rushed in first, gun raised. He went down to the floor, his left shoulder charred and bloody. The other Marines pulled back to either side of the door. One of them grabbed Williams by the feet and pulled him clear while energy bolts peppered the floor. The Sergeant looked across the damaged doorway at Jeter, their backs to the wall. Jeter reached into a pocket and pulled out an egg grenade. This one was white with a red stripe around the middle. He mouthed the words “Flash-bang,” at the Sergeant. The Sergeant nodded that he understood, turned away and covered his ears. The other men followed his lead. Jeter pressed the activation button and counted off three seconds. Then he lobbed the grenade into the room and quickly covered his own ears. The Marines stormed through the smoke and rushed inside. Lying on the floor near her pistol, unconscious, blood trickled from Jillian’s ears. One of the men he pointed to was bigger than the other. The big one said, “I got her,” and put Jillian in a fireman’s carry over his shoulder. The group left the room and headed back toward the elevator. Jeter palmed the controls and made a system override again. While they waited for the capsule, half their guns trained nervously on the elevator door, the other half back down the corridor toward the mess hall, the Sergeant motioned to Williams again. Williams nodded and painfully took off his backpack again. This time he retrieved a considerably larger explosive device, about the size of a bowling ball, complete with a timer. Williams scrambled inside. The doors shut and the pod whisked them to the flight deck. The door dinged and opened to the flight deck corridor. Everyone streamed out, stepping over bodies on the floor, and rushed to the transport. They jumped onboard and the door closed. The transport rose two meters, then raced to the portal. It slipped through the portal, turned and headed back to the Polaris. The Mule crept closer to the warship, her forward shields absorbing blows from the giant guns on the Eagle-class vessel. Behind the Mule, three dozen enemy fighter drones popped into existence. They swarmed toward the pirate ship, concentrating fire on her afterburners. Mule’s orange forcefield flickered out in the rear from the combined blasts, and the drones’ cannons struck her engine cones. Explosions rocked the ship as chunks from the stern flew off into space. Three more red bolts from Mule slammed into the warship’s bow. She popped out of sight. The holoscreen shifted. It showed the warship now behind Mule, along with the fighter drones. “They’ve got a shot right up our butts,” Granny said, her voice full of anger. Indeed, the warship’s forward guns pointed ominously at their rear, where the damaged drive cones barely covered their exposed hull. Raleigh looked at Roddy, Maxwell, and Granny. Everyone held their breath, waiting for those giant guns to fire. The huge tubes aimed right toward them, threatening . . . threatening . . . yet they remained silent. “What are they waiting for?” Roddy said. He glanced meaningfully at Roddy. Raleigh nodded in assent, and the pilot headed for the elevator. The doors opened and a pod whisked him away. Raleigh touched the implant under his ear and shifted over to the ship’s PA system. “Everybody listen up, this is Captain Raleigh. We’re crippled, and they’re behind us where our big guns can’t reach them. They’re sending over a boarding party as I speak. We suspect they’re after Jillian Thrall. Lights flashed red as the elevator door to the flight deck corridor opened. Half a dozen crewmembers ran out and scrambled into position behind hallway barricades, protrusions jutting from the walls on either side designed for this very purpose. They aimed rifles at the entrance to the tarmac, providing a solid line of defense that would prove difficult to pass. The Polaris’s transport flew through the red hexagonal opening on Mule’s port side and onto the landing deck. Jeter remained at the rear of the repelling party. The short, thick-necked man had a well-deserved reputation to be handy in a fight. No one was surprised to see him joining their first line of defense. The elevator opened and Roddy stepped out. He nodded at everybody before palming the armory panel. It opened and he selected a gun, then took up position behind the last barricade opposite Jeter. The elevator opened again and Skylar came out. She grabbed a pistol and walked confidently down the center of the corridor past the men behind the barricades, and stood facing the doorway to the flight deck. The men smiled with relief, their thoughts evident by their expressions. Skylar served as their own angel of death, and with her pulling for them they just might make it through this alive. Outside on the landing deck they heard the rails of the enemy transport thunk down on metal. Skylar lifted her pistol and flickered once. Jeter pulled out an egg grenade and tossed it underhand down the corridor in one smooth motion before she disappeared. Skylar flew forward in the blast, hitting the wall face-first. She crumpled to the floor. The two men nearest her were blown apart, their bodies mauled in the explosion. The two in the middle and the two in back survived, the metal barricades providing some protection from the grenade’s blast, but their eardrums were blown and they fell to the floor stunned, covering their heads. Jeter stepped out from behind his barricade and shot Roddy in the chest. Then he quickly walked down the hall shooting the other survivors in the head. The doorway to the flight deck blew open before he got there, and League Marines streamed through with guns out front. They stopped, confused at all the bodies in the corridor. Jeter dropped his gun and raised his hands. They pointed their weapons at him and advanced quickly down the hall. The man listened to StarCen’s voice over his neural connection and nodded. He aimed his gun at the floor and his men followed suit. He turned and headed toward the elevator. He reached down and pulled Raquel’s electronic trap out of the pilot’s pocket. Another bolt slammed into the Mule. And another. The ship shuddered with the impact, her shields flashing orange while absorbing the energy. The emotion-free tone of her voice made it seem worse to Raleigh, somehow. She spoke as if it were so matter of fact. LuteNet’s inflection-free tone at least did not incite panic, any more than the panic that already existed. At least that was a small comfort, Raleigh thought. Ultima Mule’s forward guns pivoted and shot at the vessel to her right. The Hawk-class ship’s forward guns were a set of giant, four-meter long tubes connected to her power core. Huge bolts of raw energy spewed out of them, red flashes flickering from the front of Mule’s hull with each shot. Slender Sylph’s guns fired at the same spot on the warship. Red energy slammed into the destroyer’s front shields from two directions at once. But the two Eagle-class ships controlled by StarCen had the same idea. They concentrated their much larger cannons on the Sylph. Green bolt after green bolt slammed into the pirate ship, her shields flashing orange as she absorbed the rapid-fire energy blasts. “They can’t survive that for long,” Maxwell said. The holoscreen showed the red and green bolts crossing one another, opposite ships taking combined two-on-one blows. Indeed, the front forcefield on the warship closest to Sylph flickered suddenly. Then the orange barrier disappeared altogether. The red bolts from Mule and Sylph slammed home, hitting metal now. Bits and pieces flew out into space. But the warship was far more heavily armored than the Aquamarine. It had been designed to withstand multiple direct hits even without shields. She remained in place, and continued her cannons’ horrific blitz against the Sylph along with the other ship. The Sylph’s shields failed next, finally succumbing to the onslaught. The bolts quickly blew apart her forward cannons. She stopped shooting and green explosions hit home. Flotsam sprayed out from the hits, littering the space around her. The Slender Sylph’s standard drives lit up from the aft. She moved forward, slowly at first, heading toward the shieldless warship nearest her, still absorbing hits to her bow as green bolt after green bolt slammed home. In response, Po’s voice came over Raleigh’s neural net. The Slender Sylph’s afterburners flared brighter and she picked up speed. Bolts from the warships pummeled deeper into her hull, blasting wide-open holes through her skin. Her bridge ripped off, shredded to pieces by the blasts. But her engines kept going, bringing her closer and closer to the warship. Everyone threw up arms, shielding their eyes from the light as both ships exploded in a giant fireball. The Mule shuddered as the shockwave hit. Chunks flew out in a huge radius, slinging off into the black night. The holoscreen was littered with pieces, parts, and bodies. Raleigh deflated. He watched in silence as parts of the Sylph and the warship floated away in all directions. He took a deep breath, held it a moment, then let it out slowly. The big guns of the other warship turned and aimed at the Mule. Green energy bolts slammed into their shields. The screen flashed orange as bolt after bolt blasted in. Jillian stopped at the Captain’s quarters carrying a tray with two plates of covered food. She pressed the doorbell icon on the panel and waited patiently. The door swished opened and Christopher Raleigh stood smiling at her. He stood six foot three, 190 centimeters, with dirty blond hair and bright blue eyes. Trim and fit and handsome, her heart melted at his smile and his obvious pleasure in seeing her. “Dinner is served,” she said, presenting the tray for his inspection. He stepped out of the way and let her enter his quarters. The door slid shut behind her. Jillian sat the tray down at the table and put one plate out for him before taking the other for herself. Jillian told him the story of how she and Skylar observed Roddy and Raquel getting it on at the flight deck. LuteNet’s rich contralto voice came out of the air above the table. The days stretched on, and the voyage of the Ultima Mule and the Slender Sylph to Pegasi Station quickly became one of Jillian Thrall’s favorite times in her life so far. Mornings were spent learning self-defense techniques with Granny. Jillian and Skylar progressed to the point where they could, at least occasionally, flip the older woman for a change. Granny moved on to close quarters combat, teaching them how to disarm opponents and make use of nearby objects as makeshift weapons. As they closed in on Pegasi, Granny told them their training would never really stop. But, after this crash course she felt they were at least better prepared than they had been. Afternoons were spent competing with Skylar at the makeshift shooting range on the flight deck. The girls observed Roddy and Raquel two more times. On his third visit, Jillian and Skylar were still shooting and made more than enough noise to announce their presence before the couple had a chance to start. Roddy did not show up again. Presumably he found a better place for Raquel to eat her lunch. Jillian ate suppers in the Captain’s quarters with Chris. After eating they would spend an hour or so in deep conversation. The forced platonic nature of this relationship, with the ship’s strictures against fraternization, meant that Jillian found herself focusing on Raleigh’s intellect and personality. She was drawn to him like a moth to a flame. He had seen so much of the galaxy, and he had done so much. His life of adventure she found amazing, and he gladly shared stories of space battles and other conflicts in which he had a part. As the ship’s map icon edged closer to Pegasi, Jillian felt for the first time she really knew a man. She experienced an attraction that increased over time, even with the increased familiarity. In the novels she had read and the movies she had watched, all of which combined to comprise her sum knowledge on the topic of love, she had been taught that familiarity breeds contempt. People grow tired of one another and look for variety. But she did not think she would ever grow tired of Chris. At least, not anytime soon. Maybe when they were much older and had spent years together . . . but even then, she thought, what is the point of love if not to find someone you wanted to grow old with? No, Chris felt like the kind of man she could fall even more in love with over time. As far as the rest of the crew was concerned, the Captain was known as a famous bachelor and few felt he would ever truly settle down. Granny started a pool behind the lovers’ backs. Crewmembers could bet on time remaining before their first kiss, their first major fight, and their wedding date. Jeter asked why he could not bet on the date they broke up. Granny berated him for being a pessimist. At long last, the Ultima Mule and the Slender Sylph came to within an hour of Pegasi. Both ships stopped for final preparations. Lee Po hailed Raleigh over the neural net. “Sounds good to me,” Raleigh said. The two ships resumed their journey, the seconds counting down as they made jump after jump with each tick of the clock. First Officer Elijah Maxwell opened the armory panels and made sure each crewmember had a gun. Then everybody went to their duty stations with tension filling the air. At last they stopped teleporting, one astronomical unit away from Pegasi Station. LuteNet spoke, her voice filling both ships. Fifty of the Sylph’s fighters popped out of existence, followed by another group. Within seconds they were all gone. Fifty from Ultima Mule’s flight deck followed, then another batch. The holoscreen on Mule’s bridge showed what the drones could see. Roddy sat in the pilot’s seat. Raleigh, Granny, and Maxwell stood behind him. The front of the bridge seemed to turn transparent, showing the drone feed from space, one AU away. Before them Pegasi Station floated, a small artificial moon glinting back reflected light. The Excelsior orbited nearby. But the two merchants they were expecting were nowhere to be seen. Elijah Maxwell spoke up, his voice deeply troubled within his giant six foot six, 198 centimeter frame. In place of the freighters, two more Eagle-class destroyers orbited near Excelsior. All three ships spewed out their own fighters, hundreds upon hundreds of them. They all streamed toward the pirates’ drones, filling the screen with a huge cloud of incoming bogies. She pointed to the screen. The two destroyers near Excelsior disappeared. The ship’s klaxon rang out and the lights flashed red. The holoscreen changed to show the exterior of the Mule. The Sylph floated nearby. The two new warships from Pegasi faced them. Blinding white flashed across the screen, and green bolts of energy shot out from the warships. The first one hit the shields with a solid Thump! reverberating throughout the Mule. 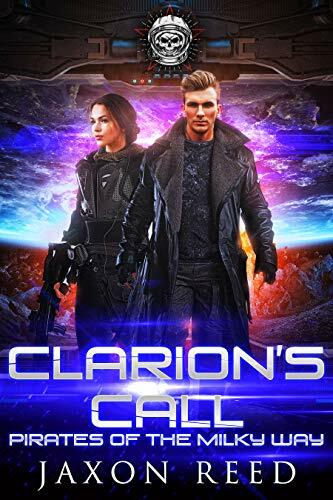 Author’s Note: the Prologue for Clarion’s Call is a bonus chapter titled “Unleashed on Raton Five, Part One,” available in the Amazon version or Patreon. Granny put both fists on her hips and looked down on the mat where Skylar and Raquel lay panting. They were all barefoot and wearing gym shorts below their t-shirts. “I don’t get how someone so old can be in such good shape,” Jillian said, equally winded. Both younger women sprang up from the mat and rushed Granny at the same time. She sidestepped and tripped Skylar, then swung around and grabbed Jillian’s arm, turning her forward momentum into a flip. Jillian fell end over end and landed on the mat again with a loud, Splat! “Who looks old and petite now?” Granny said. She cackled and walked over to offer the women a hand up. They were a week into the voyage to Pegasi Station aboard the Ultima Mule, and already the three had formed a bond while sharing quarters. Skylar and Jillian, closer in age, had more to talk about with each other. In previous voyages, Skylar kept mostly to herself, interacting with her brother Samuel and rarely spending time with others. Now that he was gone, she turned to these two for companionship. Granny served in a matronly role, freely offering advice. She also willingly served as the odd person out for the other two to gripe about. Indeed, Skylar and Jillian found themselves griping about the older woman frequently. Part of it had to do with their inability to take her down during these sparring sessions. “What do you call this again? What’s this style?” Jillian said. Granny said, “The flips are from Aikido. It’s a type of fighting that uses your opponent’s weight against them. It’s particularly useful for women because the fellas are usually bigger than we are. Granny grinned at them and pulled out a cigar she had hidden on her person somewhere. She stuck it in her mouth, unlit, and kept smiling. She walked out of the gym, leaving the younger women alone. Jillian cracked her neck and rubbed the small of her back. Granny was right. Without the mat her fall would have hurt much worse. Plus she was beginning to wonder if her long hair was going to become a problem. It certainly did not seem conducive to fighting. Skylar gave her a lopsided grin. Nobody onboard the Ultima Mule called Captain Christopher Raleigh by his first name, except Jillian Thrall. The elevator door to the flight deck corridor opened. Skylar and Jillian stepped out, now well fed, showered, and dressed again in grey slacks and brown boots below fresh white t-shirts. The corridor looked ribbed, with metal protrusions sticking out from the wall every couple of meters, each stretching from ceiling to floor. Jillian pointed at one of the extensions. 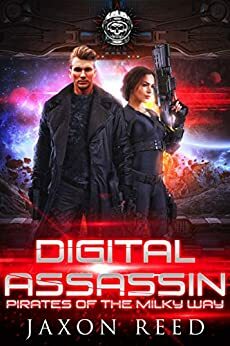 Skylar put her palm on an armory panel near the elevator and it hissed open, showing rack after rack of rifles and pistols. She handed Jillian a rifle and took one for herself, then closed the panel door. She patted the rifle affectionately. Jillian shivered. She knew that Skylar and her brother had killed a lot of people. They slung the guns over their backs and walked out onto the flight deck. They weaved between fighter drones, heading for the large hexagonal opening with a forcefield on the side of the ship serving as the flight deck entrance. The opening shimmered red and they watched the stars wink by as the ship teleported once every second. Round holograms the size of dinner plates appeared in front of the forcefield, moving in random patterns. The number zero showed on the top left of the hexagonal opening, and another one on the right. “You always beat me at this,” Jillian grumbled. Skylar raised her rifle and shot the first hologram circle. The number on the left turned into a one. Jillian shot at her circle and missed. She fired three more times before finally hitting it. Skylar shot two more during that time. Half an hour later, they called it quits. Skylar shot 111 discs while Jillian managed to hit 82. “You’re getting better,” Skylar said as they walked back toward the corridor. Jillian rubbed her arm where it cramped from holding the big gun for so long. Despite her muscle pain, she was happy with her score. It was a new personal record. They heard a Ding! from the distant elevator and a moment later Rodrigo Diego-Rodriguez, the ship’s pilot, stepped out of the corridor. He looked around, but failed to see the two walking through the fighter drones out on the tarmac. Instinctively Skylar pulled Jillian down behind one of the small crafts, and they remained hidden. Satisfied of his privacy, Rodrigo pulled out his portable radiation absorber from a pocket and pressed the button on top. A cloud of silver pixels formed, quickly coalescing into the beautiful blonde and silver shape of Raquel Kirkland. He handed her a plate of food from the mess hall then stuck his hands in his pockets while she wolfed it down in front of him. When she finished, she stepped very close to him and looked up into his face. The plate crashed to the floor as he took her into his arms and kissed her passionately. Jillian had her first opportunity to vote as a crewmember that night, after Raleigh presented the plan in the large meeting center. The general consensus was that if all went well, and if the three ships were present, the venture might net 20 million on the high end. Ultima Mule would split that admittedly optimistic amount with the Slender Sylph Company, and bring in 100,000 a share. Even with this grand estimate, everybody hoped the figure would climb much higher. Jillian was curious what the low end might be, but nobody wanted to speculate about that. Once the decision was made, preparation for departure began immediately. Raleigh accessed the company’s lines of credit from investors on Lute and began purchasing food and other necessities. Pak and Kim ordered replacement drones, new tandem drives, and spare parts. Medical supplies were restocked, fresh uniforms ordered, and cleaning and maintenance bots were ported up to the Mule to prep her for another run. Jillian returned to her quarters late that evening, filled with anticipation. Even though it would be about 25 days in each direction, she did not mind since she hoped to spend as much of that time as possible with Chris. He would likely not be kissing her on this trip. She reluctantly took note of the strictures against fraternization on voyages, especially between the officers and crew. She worried that these rules would keep him from seeing her altogether. Skylar had the room next door to her, so she asked the other woman about it before they both retired for the night. As Jillian lay in bed that night before going to sleep, she played the conversation back in her mind. Was Chris really crazy about her? She could hardly wait to talk things over again with Skylar tomorrow. The following day preparations were completed. After lunch the Ultima Mule was ready to go, and Raleigh had LuteNet port crewmembers up in pairs. Jillian was ported with Skylar. They carried their duffel bags to the elevator capsule, and made their way to the quarters they shared. Sure enough, Granny had opted to bunk with them and was already there. She pulled out a cigar and chomped down on it. With a final, “Hmph!” she turned and left for the bridge. On the bridge Granny found the Captain and Roddy. Roddy smiled wanly. She noted ever since the gunfight in the mess that he seemed down. He looked like a deep cloud of sadness hung over his head. Roddy patted his pants pocket, showing the print of the miniature radiation absorber. He nodded in acknowledgment but did not smile at her ribbing. The Ultima Mule and the Slender Sylph disappeared from their orbit around Lute. Roddy came into the mess late for supper, after most of the others had eaten and retired for the evening. Lootie had shown him the security footage of Raquel stealing food in a restaurant, so he knew she could not stay in the trap without eating. He took it out of his pocket and pointed it away from the table before pressing the button, releasing her. A stream of pixels coalesced into the attractive blonde woman. She smiled at him, demurely. He pointed at the plate next to his. She sat down and began spooning food into her mouth. Roddy watched her and recalled he had been so busy at lunch preparing to go that he had forgotten to let her out. She must be really hungry, he thought. She filled up, eating the serving of fried poshbird and mashed potatoes. When she was done, she wiped her lips on a napkin and smiled at him. She looked deep in his eyes and sensed the sadness behind them. She had stabbed him and shot him. He would almost certainly never trust her. If there had ever been any hope of using her feminine wiles on him, it was likely gone forever. The man had been hurt too much, and the cuts to his heart were deeper than the physical wounds she had given him. Ultimately, she thought, Roddy was a big softy. He nodded, then looked down at his plate, lost in thought. Raquel watched him carefully. A slow, evil smile spread across her lips. Author’s Note: To support and encourage this endeavor, please consider joining me on Patreon. For as little as $1/mo. you can read bonus chapters in all the books in the Pirates of the Milky Way series. Ambassador Huntington pulled a curl of his mustache out and let it go. The curl snapped back into position. Impeccably dressed as always, the Ambassador found himself worried once more about dust. He walked resolutely toward a small “mom and pop” communications business, a tired and worn storefront out on the street. Herman Gore and his wife Heidi ran the place, in this rundown part of Port Ryan. The couple offered secure messaging services and “eavesdrop-free” zones where supposedly even LuteNet could not listen in on conversations. The Gores were League expatriates, and Huntington remained convinced of their loyalty to StarCen despite their choice to live on a planet allied with the Republic. Based on the grimy exterior of the building, and the loose trash blowing down the street, Huntington rather doubted all the claims the couple mentioned on the floating holographic sign out front. He especially doubted their suggestion indicating the location was “the safest, most secure communications center on the planet.” He supposed there really was little truth in advertising, after all. Once inside, though, he appreciated the nice and clean interior. Everything was well lit, neat, and in order. The Gores obviously prized their reputation for privacy, and reinvested a considerable portion of their earnings into the shop’s interior rather than its exterior. Based on his research, the Ambassador knew the building was essentially a giant electronic Faraday’s cage. No transmissions, wireless or otherwise, would be going in or out without Herman or Heidi’s knowledge and consent. At least, that was the idea. Spies loved places like this, and worked hard to infiltrate them as well as use them. Not to mention, LuteNet would not appreciate being kept out of the loop as to everything happening within these walls. That rogue AI system, Huntington thought, probably kept a subroutine going that focused exclusively on this part of the city. But somehow the Gores managed to maintain a sterling reputation. And, they somehow managed to stay in business despite a dearth of customers. Perhaps that had something to do with the quiet payments they received from the League, by way of Petra Roe. Indirectly and untraceably, of course. Ambassador Huntington dropped a couple of tokens in a jar near the counter and nodded at Mrs. Gore. She smiled and nodded back. He knew the 5,000 credit tokens, one of the only anonymous means of exchanging money, would be gone from the jar before he left the shop. Despite the interior’s cleanliness, the Ambassador worried compulsively about dust. If there was no dust inside (something Huntington doubted), he surely had collected some on his suit outside. The street was filthy, after all, and the 8,000-credit suit imported from Italia was practically a dust magnet. He made his way to one of the shop’s private communication booths, entered and sat down. The wall in front of him in the tiny booth brightened suddenly, and he watched as an electronically obscured figure came into the holoscreen and sat down. This person would actually be in another location, pre-arranged with the Gores. The voice was electronically altered. Huntington could not tell the person’s gender, race, age, or much of anything. It annoyed him that this person, though highly useful for his purposes to be sure, knew him yet he had no idea of their identity. He reached over to his hypodermic bracelet, the drug delivery system filled with “Fentastic Malaysia,” a formula designed specifically for him. Touching the transmit button, he received a full dose. Instantly his body began tingling and his synapses fired up, stirring the pleasure centers in his brain. Huntington thought he heard a sharp intake of breath, but he could not be sure with the electronic obfuscations. The electronically obscured face came closer in the holoscreen to the Ambassador. Huntington knew they could see him plainly on their side. He had no need to alter his appearance, after all. He stared back at the scrambled screen with a poker face, waiting. Finally, the person sat back in their chair. Lee Po stood an even six feet, or 183 centimeters. Of Chinese descent, he had a Van Dyke beard and a ready smile. His First Officer was a young, petite redheaded woman who called herself Susan Cranberry. She seemed polite and very small at five foot two, or 158 centimeters. No one present had any doubt she was tough as nails, despite her size. Finally, Po’s Quartermaster was another woman, this one in her early 40s. She went by the name of Olivia Allbright. She wore her hair in a braid, stood the same height as her Captain, and looked rather thin. Granny had called her “Beanpole” behind her back once, and the nickname stuck, at least in private among other crews. Po and his officers stood in a conference room at Mule Tower, shaking hands with Raleigh, Granny, and Maxwell. He touched his temple and a hologram streamed out of his forehead. Three spaceships appeared, orbiting a way station. Po nodded and said, “They are like Fomalhaut, or at least how Fomalhaut was before it got wiped out.” He pronounced it Foe-mal-hot instead of the more common Foe-mah-low, making the Mule officers smile. Po’s First Officer and Quartermaster did not seem to notice. Po nodded, and gave a mental command to zoom in on the warship’s stern. Granny and Raleigh leaned in and looked. Sure enough, the light on the rear of the ship reflected back in a slightly different shade than the front. Eyebrows went up around the table on the Ultima Mule side. Po said, “We think, based on the after-battle reports from survivors on the Republic side, the Excelsior suffered major damage and heavy casualties after taking out several Republic ships. We have witnesses reporting a serious hull breach right about where those new repairs are. The merchants were collateral damage in the same battle. They were in the wrong place at the wrong time, apparently. He gave them all a toothy grin, making his beard rise up on his face. “An Eagle-class destroyer has a lot of fighter drones,” Maxwell said. “That just leaves their main cannons,” Raleigh pointed out. These giant military weapons were more formidable than the repelling units found on merchant ships. They used considerably more energy and had far more devastating power. Raleigh shared a look with his officers. They both seemed receptive to the notion. He had one final consideration, though. “Two things,” Po said. “First, Excelsior is very damaged, and has to be fitted out with hard to come by components during a time of war. Lootie doesn’t think they’re going anywhere within a three month window, at least. The breach she suffered during the battle opened up their engine room. We think no one can get in to service things right away through all the structural damage. She was able to make the jump to Pegasi, but it’s likely unsafe in her present condition for her to port multiple times and get back home without serious repairs. “How many credits in tokens are we talking about?” Raleigh said. Everybody around the table smiled now. Raleigh glanced at his officers again. They both nodded at him.